On February 18, at the Tirana International hotel, the Embassy of the Republic of Serbia in Tirana organized a reception on the occasion of the national day of the Republic of Serbia. On this occasion high representatives from different spheres of political, economic and social life of the country, representatives of diplomatic corps and others were invited. Representatives of the Serbian minority associations were also invited to this important event. Present to this event before their organizations were: the president of Serbian-Montengrin national minority association “ Moraca-Rozafa”, Pavlo Jakoja , the president of orthodox association “ Saint Jovan Vladimir”, Zoran Ajkoja, and the president of association of Serbs “ Jedinstvo”, Eqerem Duleviq with his compatriots. Present in this ceremony was the president of the newly established minority organization “ Skadarlija” based in Tirana, Salko Ferezaj- Brajoviq. 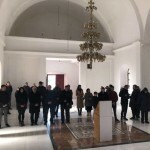 The ceremony began with the intonation of the hymns of the two states and then, the Ambassador of Serbia in Tirana, Mr. Miroljub Zaric addressed the present. In his speech, his excellence thanked all the participants for attending this event and expressed his hopes for the establishment of amicable and close relationships between the two countries. His word was applauded by those present. The ceremony lasted about 2 hours in a friendly atmosphere where free conversations took place among the many participants. On the occasion of the Statehood Day of the Republic of Serbia, the Orthodox Association “St. Jovan Vladimir”, the Association of Serbian-Montenegrin Minority “Moraca-Rozafa” and the association Skadarlija congratulate their fellow citizens and the state leadership of Republic Serbia this holiday. At the same time, we want to send the warmest wishes for a prosperous and progressive Serbia of all citizens living in and out of the country, to be home of all our people wherever they are, taking care of all of its citizens and interests. Our desires also go towards finding solutions essential for its development and progress towards European integration. With the blessing of His Beatitude Archbishop of Tirana and all of Albania. 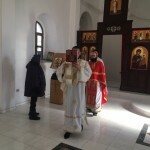 Anastas and the Archbishop of Cetinje and the Metropolitan of Montenegro g. Amphilohije, on Sunday, in the church of the Holy Trinity in Vraka near Shkodra, on the feast of St. Sava, the first Serbian archbishop and saint, the liturgy was served by priest Predrag Scepanovic, the parish of Podgorica, along with the service of the parish of Zet and deacon Ivan Popovic from Shkodra, a clerk of the Albanian Orthodox Church . 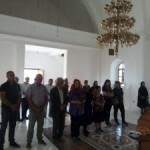 The faithful people of Vraka and Shkodra attended the liturgy organized honoring the Serbian saint. 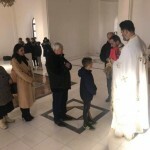 Father Predrag, during his the liturgical word, thanked the blessing of His Beatitude Archbishop of Tirana and all of Albania, Anastas, to serve the Holy Liturgy in this temple. He also spoke about the apostolic mission of St. Sava. “St. Sava loved all people. It belongs to the Serbian people, but it belongs to all nations, to all people of good will …Shkodra is a synthesis of millennial cultures, sacred places, human destinies, tragic and joyful. Many great conquerors have passed, many empires have fallen, and the silence of ancient struggles has subsided, but the story of Shkodra remains the holy city of many antiquities, many sacred places. They were not eaten by eclipses and forgetfulness, but live in the souls of you who live here in Albania, “Father Predrag said. “Today, with the Holy Sava, we blessed fields, fields and meadows for your household. May Saint Sava bless you all and let your lives bring the most beautiful moments of joy and happiness, peace, styles and love, “said father Predrag Scepanovic. In the end, representatives of the Montenegrin Metropolitanate distributed the holiday gifts to the faithful people, especially children. The celebration of the feast continued with the table of brotherhood Christian love where present were the highest representatives of the Association “St. Jovan Vladimir” and the associations of the Serbian-Montenegrin National Minority “Moraca-Rozafa”, Simo Ajkovic and Pavle Brajovic. 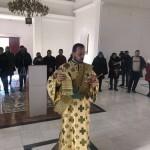 The most joyous Christian holiday, Birth of the Lord Jesus Christ, this year, was solemnly and prayerfully celebrated in the temple of the Holy Trinity in Vraka near Shkodra, a place of prayer and gathering of our Serbian people living in Shkodra. 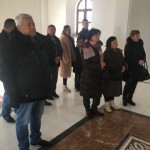 The Christmas celebration began on Easter Day, Sunday, January 6, 2019, when the believers gathered around the burning barn in front of the Temple of the Holy Trinity in Vraka. On this occassion with the blessings of His Blessing Archbishop of Tirana and all of Albania. 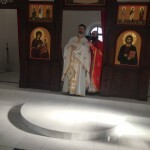 Anastas Janulatos and the Metropolitan of the Montenegrin region Amfilohije Radovic, in the church, the liturgy was served by the priests of the Albanian and Serbian Orthodox Church. 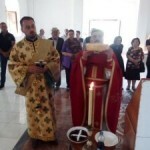 The liturgical assembly was commissioned by Predrag Scepanovic, a parish of Podgorica with the service of the deacon Ivan Popovic, a clerk of the Albanian Church. “Glory is in the height of God, and on earth peace and good will among men. Brothers and sisters, I greet you with the many years of greetings “Peace of God – Christ is born”. He was born as a frail child, He who created both mountains and valleys and mountains and sea. All this God of love created for us and for our salvation. He was born in a barn, he was not born in palaces and castles, so poor people would say this is far from us, this is a rich man. And since His birth to this day, only the one who has God in himself is rich. That is why Christmas is the embrace of God and man, that is why God has passed such a path to become the God who is with us. That is why His birth from the foundation changed human life, human history. He became a man just to overcome death, that is the last enemy who kept the human race in claws. That is why this joyful day of Christ’s birth is a great feast. A holiday when God becomes one of us and when Heaven sends the most beautiful treasure of the news to the earth, God will become man and will embrace us with this eternal embrace. That is why all of us, who are baptized in the name of the Father, the Son, and the Holy Spirit, have clothed ourselves in Him, the Christ of the Love of God. That is why all those who fasted and prayed for the sacred ceremony, all those who recognized the coming of God into this world, are blessed, because He is in a cavalry, with the sheep and lambs, by these little creatures of God, God has become man . Each of us has either a birthday or a special day, but this is the birthday of all the people on earth, all those who love God, and if we do not love God, we will not be able to love his brother who is next to us. If we love God, we will love the brother who is next to us. That is why we are all eternal brothers, precisely because God has become a man. Therefore, blessed is this day, blessed is this feast, blessed are these fields, fields and meadows, this lake blessed, these mountains, all these landscapes. For everywhere God has declared and revealed, it is not a God far away, a greater power, but it is the God of love, our Lord Jesus Christ is the Savior of the world and man. May the love of Christ, the love with which we warmed yesterday with the fire of the God-given Christ in the cave of the city of Bethlehem , because it was cold when the savior of the world was born in a cave, healed us all. It is still cold today, but in our hearts and souls there is love that warms us. Let the love of Christ the God of mankind be an atmosphere that you will breathe, bring into your homes the most beautiful moments of joy, happiness, peace, love, and love, and with your brothers Albanians, with all good-will people from east to west from the north and the south. This is what the God of love instructs us, the God who has become a man so that we too can become gods, as our Holy Fathers say. May God bless you and let the God-bearing Christ protect your dear, guard your family. The peace of God is born, concluded Predrag’s father. All present and especially children were presented gifts from the Metropoly and his grace the Mitropolitan Amfilohije. 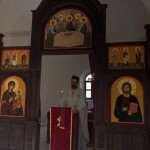 After the liturgy in the temple of the Most Holy Trinity in Vraka, gathered at lunch and were greeted by Simo Ajkovic, President of the Orthodox Association St. Jovan Vladimir who said: “My dear brothers and sisters, at this brotherly lunch I greet you all with heart and say that Christ was born. We gathered first in our church, where we listened to our priests how to meet each other, how to serve the highest God and how to make a style to one another and that we always help one another in both the will and the trouble. On behalf of the Society of St. John of Vladimir, I salute all Orthodox Christians of our faith that celebrate Christmas in the Julian calendar. This is a great honor for us because in Albania we do not have a non-working day for this biggest event in Orthodoxy on the feast of the Birth of Christ. God will grant that the authorities in Albania will think about us and that we will have the same rights as the rest of believers celebrating their holiday. On this occasion, I salute our great, saint of our, the Metropolitan \Amfilohije, who is celebrating his 81st birthday today. Let him be a happy birthday, let him live many and many summers, for our good, for our faith and for our Orthodoxy. I want all of you brothers and sisters to be healthy , and always gathered and looking forward to more feasts like this to come. “Honorable brothers and sisters. God hugged man on this day and sent us a message that we should hug each other because the deepest truth is “I saw my brother, I have seen my God.” Old Serbian wisdom says: “If you want to live, plant a field. If you want something to live for decades, get a the vineyard planted. If you want to leave something after your life, write a book. And if you want something eternal to be done, build a church. ” Thus, more than twenty years ago in the ancient city of Shkodra, which for millennia in its bosom hides many secrets, many good and evil masters, who built it and demolished it and renewed it again. So, this is Shkodra today for us, and has opened up our hearts and our souls until now. We would like to thank one more blessed Archbishop of Albania, Anastas, for the blessing of serving the Holy Liturgy, and we thank the father Ivan Popović from Shkodra who served and made us a spiritual joy to celebrate Christ’s birth together. “Christ is born. I would also like to speak a few words this time, Christmas, which is one of the most important annual days that we celebrate in Shkodra. All public opinion should know that we are not left in Shkodra, we are not lost, but we fight and we have found our supporters of this high type, such as Mitropolitan Montenegrin mr. Amfilohije Radovic, as well as his, good, high and smart, dynamic associates and priests. They made us give us the ability and the power to somehow find ourselves and survive in the Shkodra we live in, and in Shkodra we have not been forgotten. On this occasion, I congratulate His Highness and the birthday. Let God have him over 100 years, and not only him, but everyone around him. In our life and survival in Skadra there are difficulties, and those who explore and speak about us, and consider that we are poor in numbers in number, let them know that we are rich in community and congregation. During the solemn lunch, traditional Serbian and Montenegrin and songs from Shkodra region were sang by the present. Today, the broadcasting of news and programs in the Serbian language on the local television Tv Kopliku started broadcasting again. For the fifth year in a row, this project of Morača-Rozafa Association has been enabled thanks to the co-financing of the Ministry of Culture and Information of the Government of the Republic of Serbia as the result of cooperation between the Ministry and this association in Skadar. News on this program will be broadcasted every Saturday from 19-20 hrs, with a replay on Sunday from 13-14 hrs. The goal of this multi-year cooperation project with the Ministry of Culture and Information of the Republic of Serbia is to enable media informing in the Serbian language for the members of the Serbian people in Shkodra and beyond, made possible by the the wide area of the frequencies of this TV station as well as the preservation of the Serbian language as an instrument for strengthening national identity and nationality our people. This program, apart from the news program, shows half-hourly documentaries , songs and music from our Serbian folklore from the motherland, as well as other contents that emphasize the history and culture of the Serbian people. It is worth mentioning the great effort and passion that is being invested by the activists of the Morača-Rozafa Association and the staff of Tv Kopliku for the realization of such a show. This show will last until December with the hope that it will broadcast in the near future all year round and without interruption. 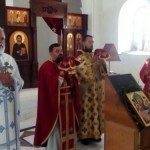 On Sunday, May 27, in the church of the Holy Trinity in Vraka was celebrated the day when the Holy Spirit descended on the Apostles – the Holy Trinity. With the blessing of the Archbishop of Albania Anastas and the Metropolitan of the Montenegro Amfilohije, the holy liturgy served the clergy of the Serbian and Albanian Orthodox churches. Priest Velimir Jovovic served jointly with father Radomir Nikcevic, the archbishop of Herzegovinian and the director of Svetigora and the deacon of Skadar Ivan Popovic. 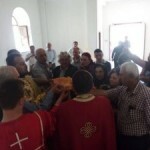 The liturgy was attended by believers from Shkodra, Vraka and the surrounding area, as well as from Montenegro, who came to gather around their Holy Church to commemorate this wonderful and blessed holiday. After the communion of the faithful people, father Velimir Jovovic and deacon Ivan Popovic were refreshing and cutting the Slava cake. Father Velimir congratulated the holiday and glory of the church and thanked the Archbishop Anastasije for the blessing that the Holy Liturgy will be served in the Serbian language. Then gifts were handed to all present believers and especially to the children who also received the blessing of the Metropolitan of the Montenegrio Amfilohije. The celebration was continued at the nearby restaurant where a cocktail was organized for the present, with the love, organization and hospitality of the members of the Association Moraca-Rozafa and the Orthodox Association “ St.Jovan Vladimir’ from Shkodra. On this occasion, the writer Budimir Dubak addressed the hosts for the hospitality in the ancient city of Shkodra.